In the wake of the Leveson Report, Julian Petley, Professor of Screen Media at Brunel University looks beyond the disinformation campaign and dissects exactly how the Royal Charter will change the media industry in Britain. "There is an urgent need for a system of self-regulation ensuring that what we read in British newspapers has at least some relation to the truth". In the early hours of Monday 18 March an agreement was reached by the Tories, the Liberal Democrats and Labour to set in motion the machinery for creating a royal charter which would underpin the effective self-regulation of the British press and guarantee the independence of the new regulatory system from government. Almost immediately, however, the Tories on the one hand, and the Liberal Democrats and Labour on the other, began to make contradictory claims about the charter. Further confusion was then caused by most of the press, with the honourable exceptions of the Guardian and Independent, engaging in an absolutely hysterical campaign of screeching disinformation against the proposed measure – proof, if any were still needed, of the desperate need for a regulatory system which at least tries to make newspapers disentangle fact from comment and news from views, not to mention from fiction and downright lies. So, beyond the political spin and the press caterwauling, what has been proposed thus far is as follows. The royal charter will establish a Recognition Panel which will give official recognition to new self-regulatory arrangements for the press. But it will be up to the press itself to establish a new self-regulatory body. 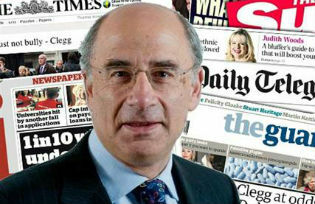 However, if newspapers refuse to recognise the Panel, or if they establish a form of self-regulation which is not accepted by it, then, as a result of amendments to the Crime and Courts Bill, and in line with the recommendations of Lord Justice Leveson’s report, they will be liable to exemplary damages in the event of civil court cases arising from stories which they have published recklessly. The new arrangements will be entrenched by statute so that they cannot be changed by ministers – either in order to water down regulation at the behest of the press or to toughen it in order to please politicians or other critics of the press. Thus the charter will be established by an amendment to the Enterprise and Regulatory Reform Bill. This amendment doesn’t actually mention the press at all, but simply states that any such charter which comes into being after March 2013 can be amended only if there is a two-thirds majority vote in both houses of parliament. This clause is absolutely essential, because bodies established by royal charter are normally closely overseen by the Privy Council, which is in fact a committee of ministers. Thus without the clause, ministers would be free to meddle with the new self-regulatory system, which would indeed give credence to those who claim that the new measures introduce a degree of ‘state control’ over the press. However, as indicated earlier, the royal charter device rather confusingly allows for both sides of the political debate to claim victory on the statutory sticking point. On the morning of 18 March the Tories were obviously desperately keen to reassure their numerous and highly vociferous press allies that they’d beaten off any attempt to introduce ‘statutory regulation’ of the press, whilst the Liberal Democrats and Labour were concerned to assure the public that they had devised a mechanism which would deliver the kind of effective self-regulation which opinion poll after opinion poll shows that the vast majority of people actually want. So, first up that morning was shadow culture secretary and deputy Labour leader Harriet Harman, announcing that the agreement reached between the parties would ‘involve a bit of statute’ and would have a ‘legal underpinning effect’. She also stated: ‘What we don’t want is to have a situation on where everybody agrees what the rules should be and then the press lean on ministers and ministers water it down’ (an understandable and long-term concern of both Labour and the Liberal Democrats). But she was closely followed by culture secretary Maria Miller, who claimed that: ‘There will be no statutory underpinning. What we’re talking about here is simply reiterating the fact that there can be no change to the charter as we move forward. I mean, this is already incorporated into the charter and has been from the beginning … This is not statutory underpinning, it is simply making sure that there’s no change – it’s a no-change clause’. She also took the opportunity to aim a side-swipe at Labour, asserting that we’ve stopped Labour’s ‘extreme version of the press law’ (which was in fact no such thing). Then it was the turn of David Cameron himself, keen to stress that he had not ‘crossed the Rubicon’, nor introduced legislation to regulate the press specifically, since, under the new arrangements, there would be no law that mentions either the press or the new regulator. As he put it: ‘It’s not statutory underpinning. What it is simply a clause that says “politicians can’t fiddle with this”, so it takes it further away from politicians, which is actually, I think, a sensible step. What we wanted to avoid and what we have avoided is a press law. Nowhere would it say what this body is, what it does, what it can’t do, what the press can or can’t do – that, quite rightly, is being kept out of parliament’. (All quotes from http://www.guardian.co.uk/politics/blog/2013/mar/18/leveson-press-regulation-royal-charter). If, understandably, you’re now becoming confused, the best way to sum up this arrangement is to think of it as ‘statutory protection’ rather than ‘statutory underpinning’. But the crucial point here is that the new self-regulatory body will be independent of both ministers and of the press. And it is its independence from the press that has caused such outrage in the columns of the newspapers (although, in order to appreciate this, it takes a fair amount of subtextual analysis of the clarion calls to defend ‘press freedom’). Thus the appointments panel for the new self-regulatory body will be set up in accordance with civil service rules, and will have a majority of members who are independent of the press, although one person ‘with a current understanding and experience of the press’ and one serving editor will be permitted to be members of the panel. However a proposed member of the regulator will not need to have the unanimous support of the panel, which effectively removes the industry’s right of veto over membership of the regulator. Absolutely in line with the demands of the newspaper industry, the Tories had in their original royal charter proposed that membership of the regulatory body should be restricted to those who ‘in the unanimous view of the appointment panel, having taken fully into account representations made by any affected party, and having regard to any publicly stated position of the individual concerned, be a person who can manifestly act fairly and impartially in the decision-making of the Board’. (https://www.gov.uk/government/uploads/system/uploads/attachment_data/file/142428/Royal_Charter_14_March_2013.pdf). In other words, no pesky journalism professors or members of Hacked Off. The absence of this thoroughly objectionable clause from the charter unveiled on 18 March marks a major defeat for both the Tories and the newspapers, but it is also the hallmark of the independence of the regulator – from the press, that is. A further bone of contention for the press is that the new body will have the power to ‘direct appropriate remedial action for breach of standards and the publication of corrections and apologies’ and to ‘direct the nature, extent and placement of apologies’. (https://www.gov.uk/government/uploads/system/uploads/……..pdf). In the original Tory version of the charter the regulator could only require newspapers to carry out such actions, whereas the word ‘direct’ means that the regulators’ instructions are legally enforceable (a distinction of which the newspapers’ lawyers were well aware). Among other things this will prevent newspapers burying embarrassing corrections and apologies on pages where no-one will notice them. Whilst the press has constantly stressed the importance of any new regulatory arrangements being independent of government, the general public has repeatedly made it abundantly clear that such arrangements must also be independent of the press, as well as being far more effective than the Press Complaints Commission (both of which amount to the same thing). And although one might instinctively be wary of a document which begins ‘Now know ye that We by Our Prerogative Royal of Our especial grace, certain knowledge and mere motion by this Our Charter for Us, Our Heirs and Successors will, ordain and declare as follows’, the uproar and tumult which the charter has brought about in the press barons’ camp is the clearest possible proof that it has merit. George Orwell once said that ‘just because you read something in the Daily Telegraph doesn’t mean it’s wrong’. However, what is currently passing for ‘news’ of the charter in the Telegraph – and in the Mail, Express, Mirror, Sun and The Times, and also in Peter Preston’s increasingly eccentric bletherings in the Observer – is about as wrong as it’s possible to get, and the clearest possible indication of the urgent need for a system of self-regulation capable of ensuring that what we read in British newspapers has at least some relation to the truth and generally conforms to the standards of journalism appropriate to a democracy. Julian Petley is Professor of Screen Media at Brunel University.